DARPA has taken another page from science fiction writer William Gibson's book by creating a neural implant to enable engineers to remotely manipulate a shark's brain signals. This would allow them to control the animal's movements and possibly decode their perceptions. Given that sharks have senses that humans don't have (like the ability to sense electromagnetic fields), it could open up some interesting uses. The implant consists of a series of electrodes embedded in the shark's brain; different electrodes can be used to stimulate different areas of the brain. In addition, the DARPA researchers want to use their setup to detect and decipher the neural patterns that correspond to shark activities like sensing an ocean current, a particular scent in the water or an electrical field. NUWC is developing a fish tag whose goal is attaining behavior control of host animals via neural implants. This talk discusses a shark tag ... intended for long-term open ocean field efforts investigating viability of animal behavior control and its utility for networked sensing and data acquisition. The tag is centered on a multi-channel neural ensemble reader, a processor to interpret the readings in real-time, and a multi-channel stimulator, intended for both micro and macro stimulation. To date results include neural ensemble recordings and stimulation of Mustelus Canis and Squyalus[sp] Acanthias. 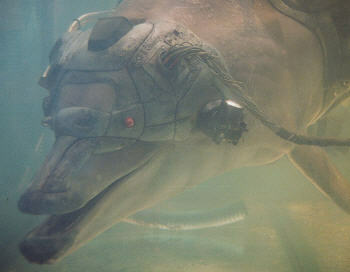 In Johnny Mnemonic, William Gibson wrote about Jones, a military surplus dolphin cyborg. Of course, there is only so much you can do with a friendly dolphin. Maybe that's why DARPA's military sponsors have chosen sharks. Take a look at these related stories about scientists who have used implants to 'jack' into a cat's brain to see what the cat is seeing, or other researchers who have implanted RFID chips in birds to warn of Avian flu. Read more about Stealth sharks to patarol the high seas.